Heavyweight boxing hasn’t had an undisputed heavyweight champion since Lennox Lewis, way back in 2000. 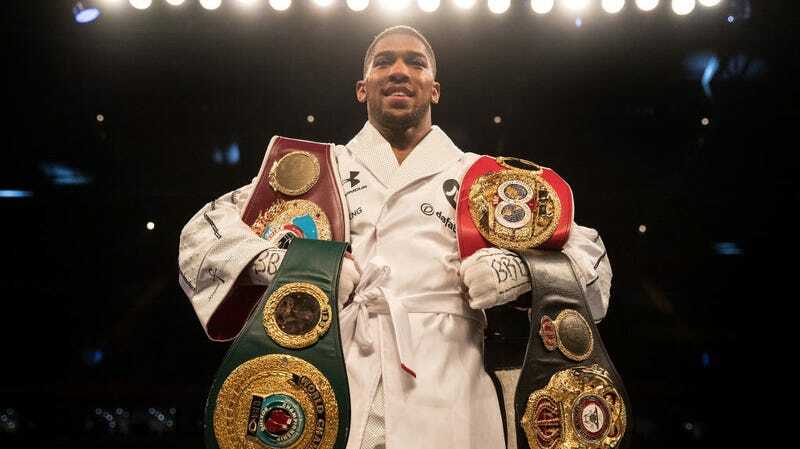 Joshua has unified four of the five main titles (boxing really does have sanctioning bodies bursting out of its greasy woodwork), with Wilder holding that elusive fifth belt. Wilder scored an impressive knockout of Luis Ortiz in a title defense back in March; Joshua claimed the WBO belt via a unanimous decision over Joseph Parker later in the month. The Joshua-Parker fight was billed as Road to Undisputed, with the inevitable final piece being a Wilder-Joshua mega-fight. But with Wilder reportedly agreeing to hold the fight in the United Kingdom, pending Joshua’s decision on the $50 million, the location is no longer a sticking point, and it sounds like the only remaining detail to hammer out is the exact date—sometime between mid-September and the end of November, depending upon the timing of a potential Gennady Golovkin-Canelo Alvarez rematch. Whenever it happens, and whatever the eventual split, it has the makings of a monster.